Sprinkle yeast over warm water and set aside for 5 minutes. Meanwhile, combine hot milk, margarine, sugar and salt in a large mixing bowl. Let stand until margarine melts. Beat in 1 1/2 cups of flour. Add yeast mixture, cinnamon and egg. Beat until combined. Add other 2 cups flour and process or mix and knead on board. Add additional flour if needed. Place dough in greased bowl. Turn to grease top. Cover and let rise about 1 1/2 hours or let rise in the refrigerator over night (bringing dough to room temperature before continuing). Punch dough down. 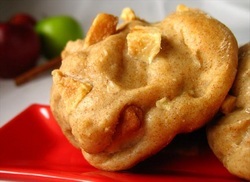 Mix in apples. Divide dough into thirds. Cut dough with shears or chop with sharp knife. Shape cut dough into six mounds on a greased baking sheet. Repeat with other two sections of dough. Cover and let rise at room temperature until double in bulk, about 1 hour. Uncover and bake at 350 degrees for about 15 minutes or until golden. Meanwhile, place powdered sugar in food processor or blender. Process until fluffy, not lumpy. Slowly add lemon juice and keep processing until smooth and satiny. While fritters are still warm spoon on glaze.